As Abraham was nearing the end of his life, he sent his best servant back to the land that he came from to find a wife for Isaac, his promised son. The servant promised Abraham that he would go back to Abraham’s land and find Isaac a wife from Abraham’s own family. As the servant approached Abraham’s former homeland, he prayed for God’s help to find the right woman to become Isaac’s wife. While the servant was still praying, a young woman name Rebekah came out to get water from the well. 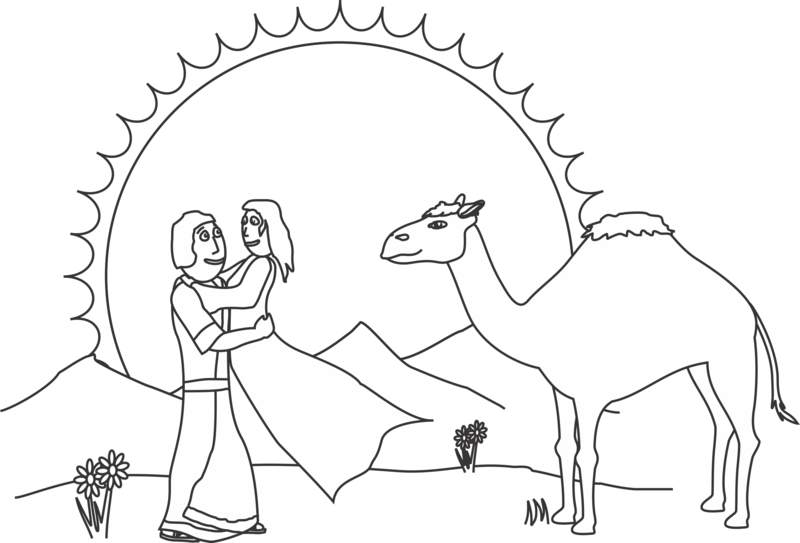 The servant asked for a drink and Rebekah not only gave him a drink, but gave water to all the camels that were with him as well. The servant knew that this was the right woman for Isaac and that God had answered his prayer. After Rebekah’s family gave their blessing, Rebekah left with the servant. As they approached Abraham’s home, Isaac was sitting in the field. Isaac and Rebekah saw each other. They were married and love each other very much. God’s promise to Abraham would now continue on through Isaac. 1. Before you begin your story, select 4 kids to be your helpers. 2. As you introduce each of the main characters in the story, dress them with a scarf. a. For Abraham, wrap the scarf around the shoulders, with the ends hanging in the front. c. For Rebekah, place the scarf over her head, with then ends hanging in the front. When you get to the part of the story when she sees Isaac for the first time, move the scarf on her head so that it also covers her face. d. For Isaac, place the scarf on the head with the ends hanging in the back. 3. Feel free to move your children around as you tell the story. This is a visual demonstration of the story for them. Be as creative and fun as you like. 1. Divide the group into two teams. Make one of the girls on one team the bride, and make one of the boys on the second team the groom. 2. Explain to the children that after Isaac and Rebekah met each other, they got married. A wedding is a very big, special occasion. The bride and the groom dress in beautiful clothes for all to see. Tell the kids that there job will be to make beautiful clothes for their bride and groom out of toilet paper. Encourage the kids to be creative. Have them try to make a veil for the bride, shoes for the groom and even flowers. 3. This game does not have to be competitive. You can give them a time limit, though, to encourage them to work quickly. 1. Paint each child’s hand with brown finger paint. Make sure that you paint the entire hand, including a small portion of the wrist area. Have them put their hand print on a piece of white paper. Turn their paper around so that the fingers are facing them. Add an extra finger print coming up and out from the thumb print. This will be the neck and head. 3. After the paint has dried, the kids can add a face, tail and goofs to their camels using crayons or markers.